Tri Sesira one of Belgrade’s Best Restaurants. Looking for a place to dine and have a true Serbian experience. Tri Sesira offers a menu with an assortment of traditional Serbian meals for you to taste as well as an A la carte menu. They also have a great selection of local and imported wines as well as traditional Serbian plum brandy “Rakija” to accompany your meal. The atmosphere is excellent and you will be sure to enjoy the live music of the orchestras that play traditional Serbian music around the tables for the guests. The resturant provides great friendly service with a smile and the staff will really make you feel comfortable. It is located at Skadarlija which is one of Belgrade’s top attractions in Belgrade’s city center. 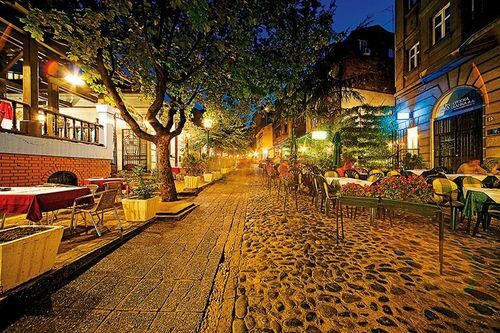 Skadarska street is a narrow street with cobble stones and is known as Belgrade’s bohemian quarter, the street is filled with restaurants and bars and is really quit charming. Tri Sesira is opened for lunch and dinner and is opened till late for your convenience.